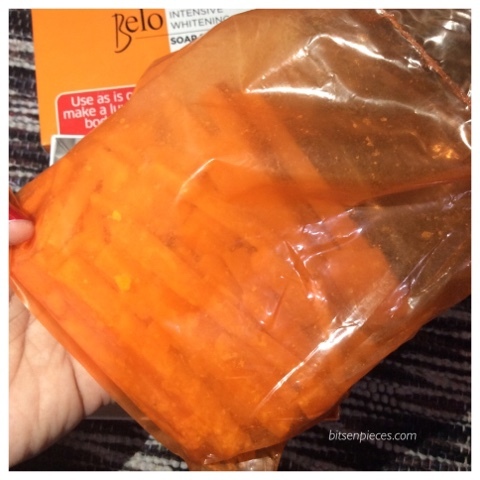 Healthy Goodness Food Prize from Elle & Vire Philippines, Thank you! 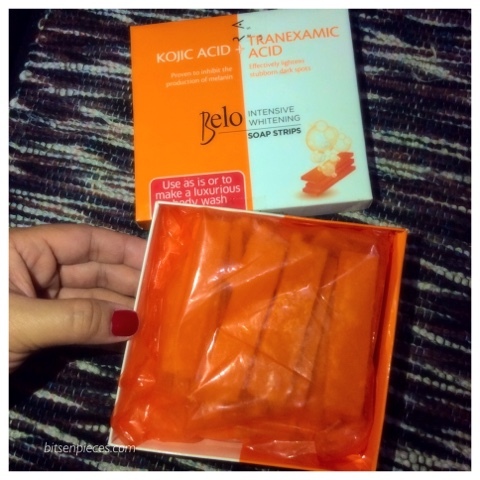 Valentines Day prize from Elle & Vire Philippines Facebook page worth P1,500 was delivered to us yesterday. 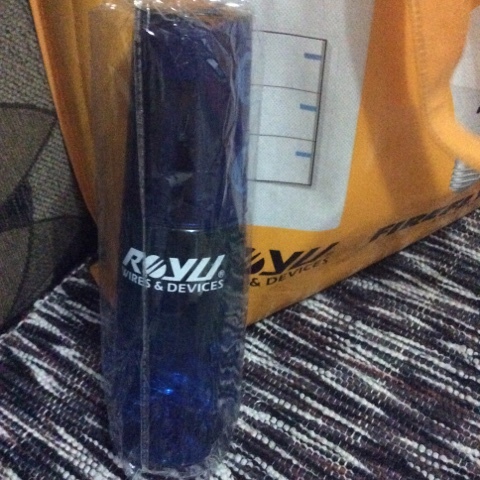 The winner announcement was made last February 12 and this goodies were personally delivered by their delivery truck at the address we mentioned from the private message. 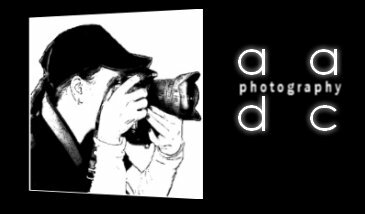 Out of the many photo entries who submitted, Dongski's entry was chosen. 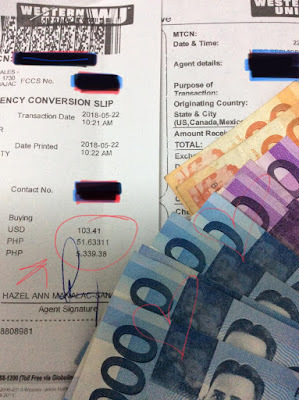 Since he cannot personally claim the prize in Manila we coordinated for the prize for shipment or delivery. 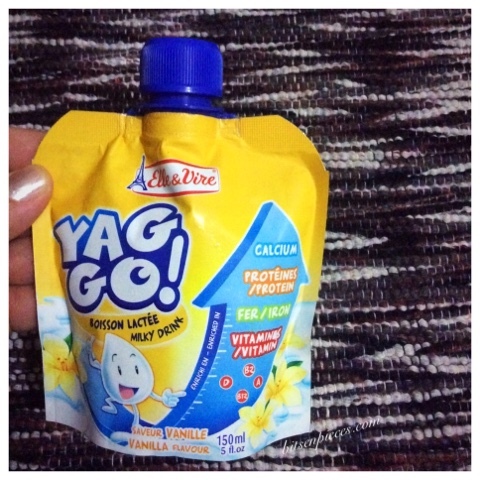 I love winning food items specially the healthy ones, definitely my kids will enjoy cup after cup. Most of the items in this brand will be our first time to taste and this excites us. Let's go through the items one by one. 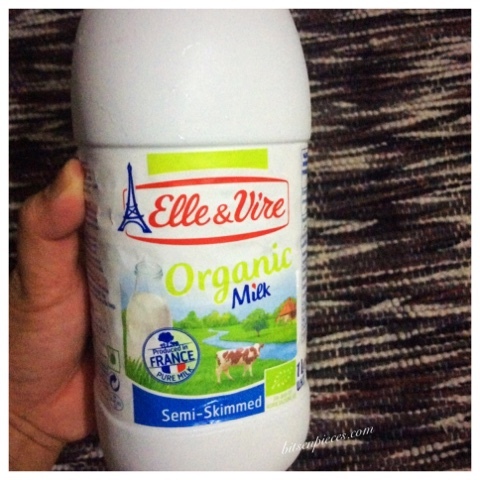 A liter of Elle & Vire semi-skimmed milk and yep it's organic. I just purchased a couple of liters of Arla all natural low fat milk last weekend which I am enjoying. 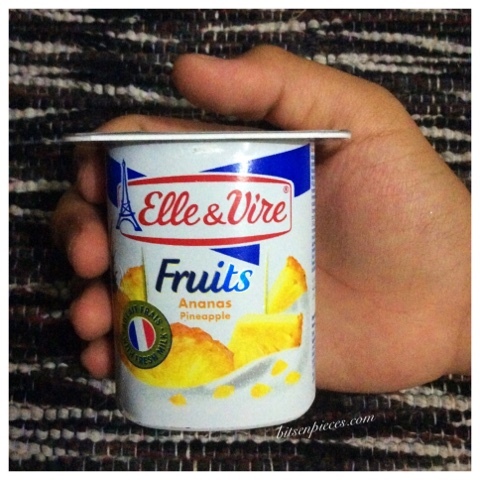 I posted an Instagram photo of the Arla brand milk here , used it as the cream for the mango smoothie which me and my daughter craved for days. It was smooth and has a nice taste. Also, another liter of whole milk comes with the prize. Are you like me who always include milk in the grocery list? Milk is one of my grocery food essentials, I keep it a point that I have a liter in my shopping cart. Let's now check the yogurt flavors from the prize. "The word Ananas is derived from the Guarani name for the pineapple, via Portuguese. In most languages, pineapple is called "ananas"." 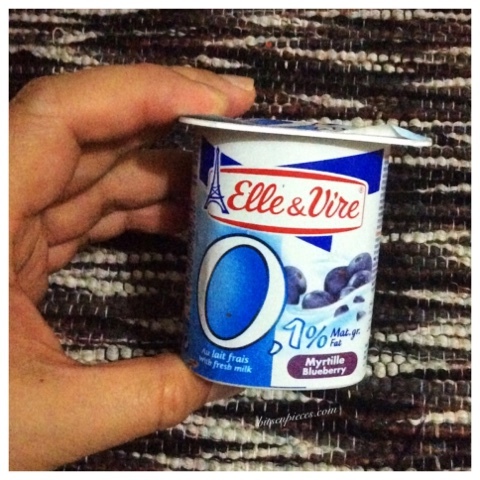 Elle & Vire Myrtille Blueberry, my son had this for breakfast this morning it has almost the exact taste from the other brand of yogurt we used to buy. It's creamy and tangy at the same time, he said. 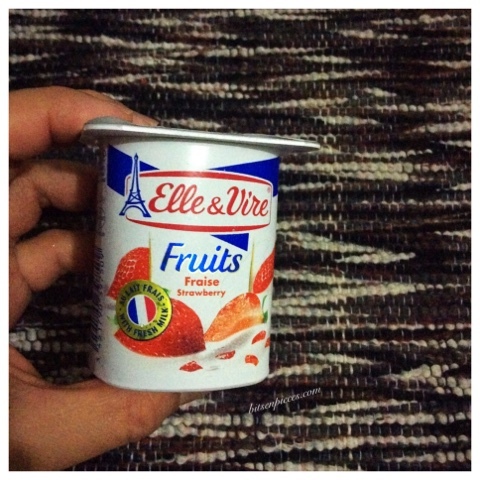 Elle & Vire Fraise Strawberry, my daughter brought a cup for her school snack and will ask her later for the taste. 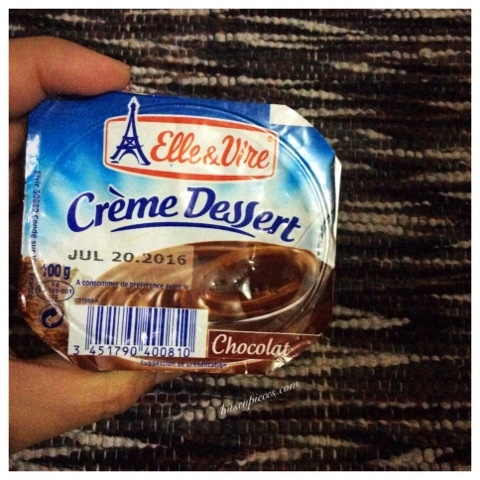 Elle & Vire Creme Dessert Chocolate, consumed the three cups last night after dinner as our dessert. I like the creamy and chocolatey taste, it was just right not too sweet or bitter. I might grab cups of this on my next grocery shopping. 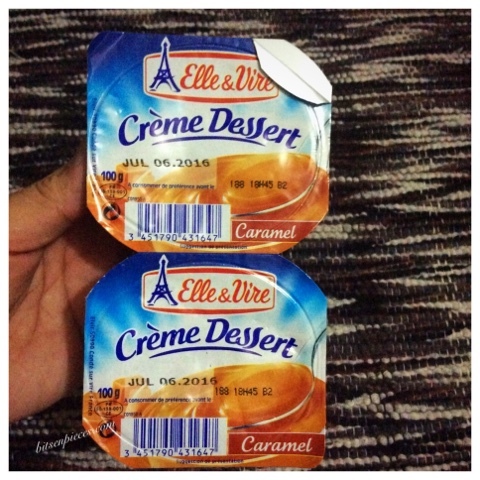 Elle & Vire Creme Dessert caramel, what I like about this flavor is that it's creamy and smooth with the hint of the caramel sweetness. Elle & Vire Yag Go! milky drink 150ml single sip pouch, my daughter also brought one for her school snack this morning. I think and hope she will like this too. 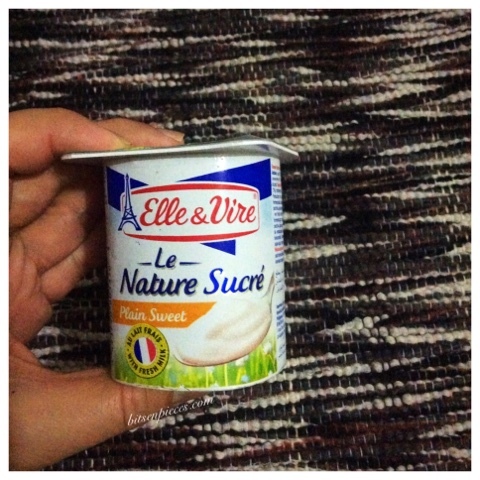 I was hoping for Elle & Vire butter for bread spread to be included in the prize bag but unluckily it was not, I guess the reason of transporting the product was much delicate unlike the plastic bottles and cup containers of the yogurt. Nevertheless, everything is good! 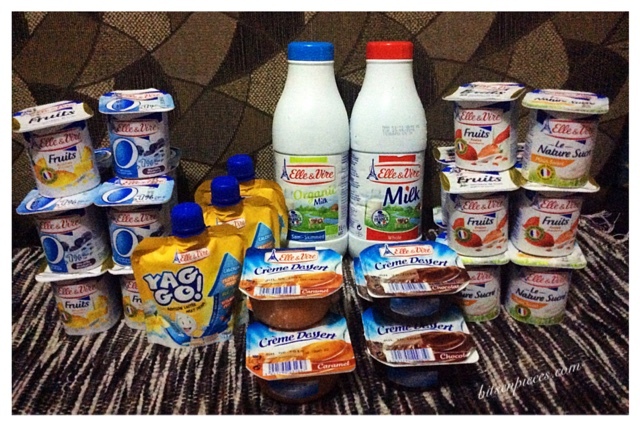 Thank you Elle & Vire for choosing Dongski's entry and sending us nutritious goodies my kids and family to enjoy. Last month I was one of the lucky winners from Firefly Lighting Facebook page Like, Post, Share and Win. They gave out trivia questions for their fans to answer and from the pool of entrants they picked out winners. From major to minor prizes they sent our private messages and tagged the lucky winners. I coordinated the claiming of the prize with their page admin since I am too far from the location where prizes can be picked up. 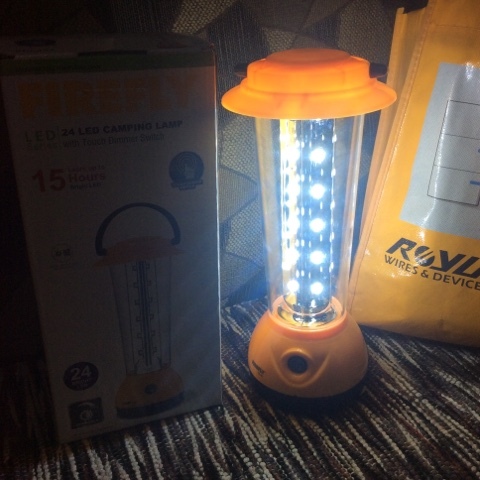 Good thing there's ACE Express store here in SM Olongapo where Firefly lighting staff sent in the prize for me to claim. Check out the loot bag I got with all the cool stuffs in it. 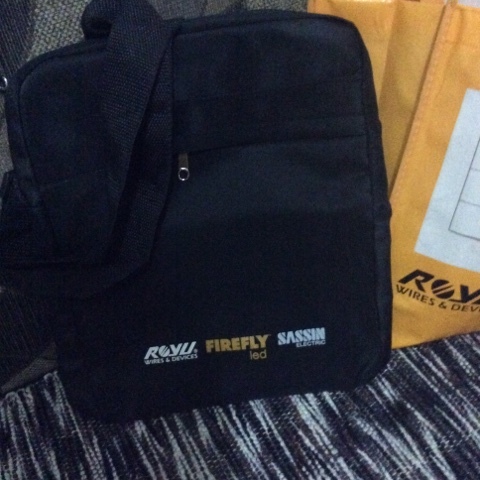 Thank you Firefly Lighting for these cool items... major prize! 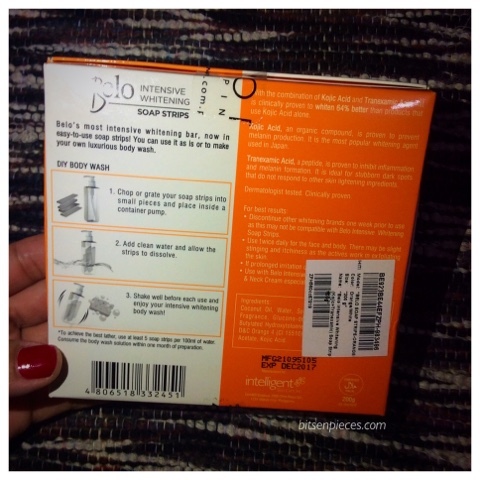 I liked everything in the loot bag specially the LED camping lamp which we tested right away and it can light-up the whole room. 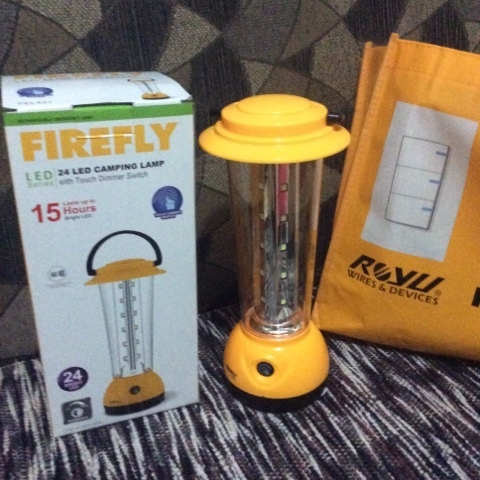 Firefly LED series- 24 LED camping lamp that can light up to 15 hours. It works with just a touch button to power on and off, plus the light can be adjusted to maximum to minimum light. 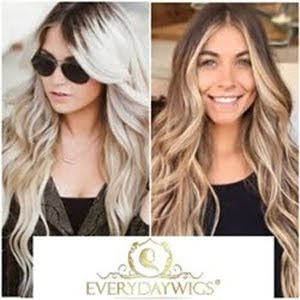 The lamp is so light-weight and I love the color too! My daughter M can't wait to use this on her next GSP camping.. soon! 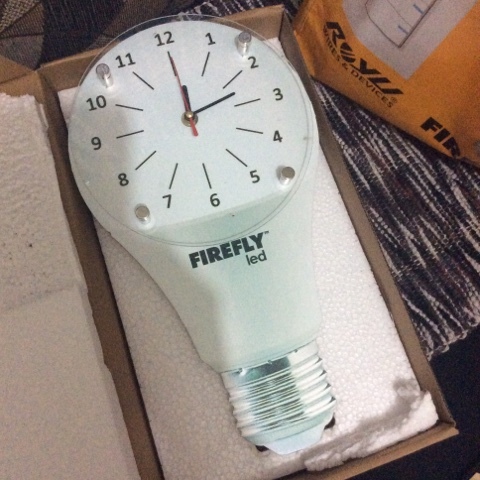 My son hanged the Firefly wall clock right away after he placed one double A battery in it. 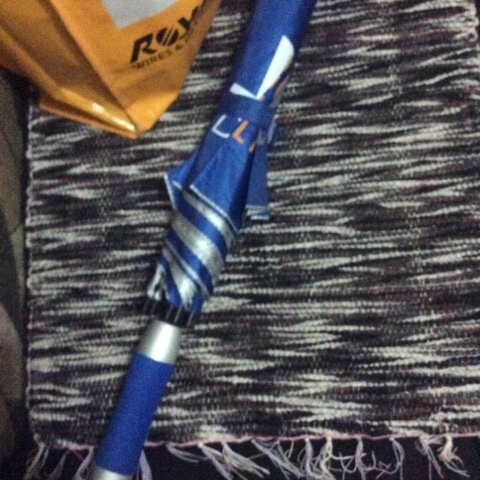 Additional blue umbrella we can use in the future. 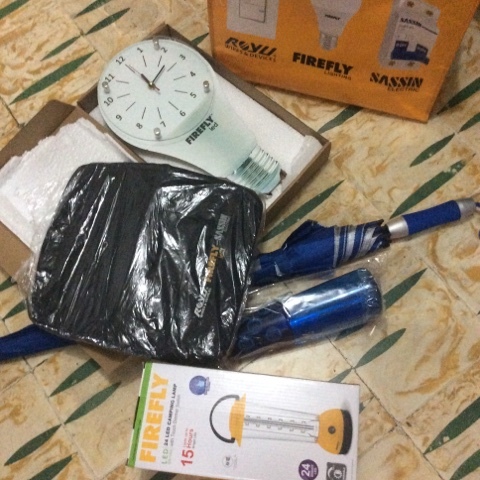 Thank you Firefly Lighting for the items you sent me, More power! When the month of February sets in most of the people denotes this month as the season of LOVE... the Valentines. Back in my childhood days Valentines was always in the school calendar, and those cut-out cupids and hearts in red colored cartolina papers were the popular Valentine decor inside the classroom. I saw one window display last Friday when I was walking home from work and it did brings memories. For this years Valentines Day, I was treated like it was my birthday! It started last Friday when I was surprised to see a new home computer chair I was wanting to have. Last, Thursday night the man heard me complaining about my my aching back right after I finished doing my blog and my online stuff. I checked on an online shops and saw some computer chair I wished to have. The following day I already have it set-up in my table, plus it can also be use as my dresser chair, the multi-functional chair. This ergonomic computer chair comes with the arm rests, a not to bulky back rest in blue color ( i have not removed the plastic cover yet), with adjustable height too. 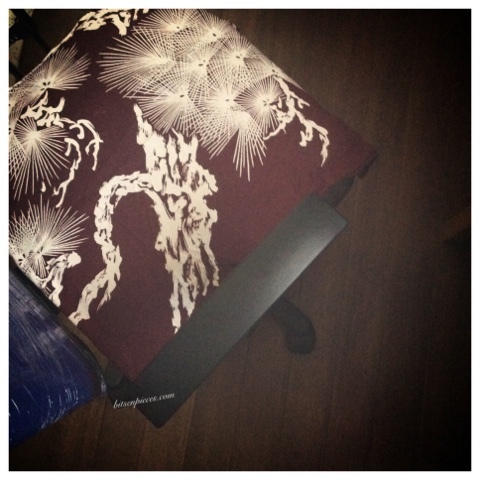 I covered the seat with my old cotton scarf which you can see. I wanted some print in it that's why. Overall, this computer chair is just perfect, the one I wanted. Thank you Tay for this gift of comfort this hearts day, i liked it! Yesterday afternoon after my nap, I was surprised by my Angel. He told me that he will go out for a few minutes to buy something at SM supermarket, he'll be back right away. 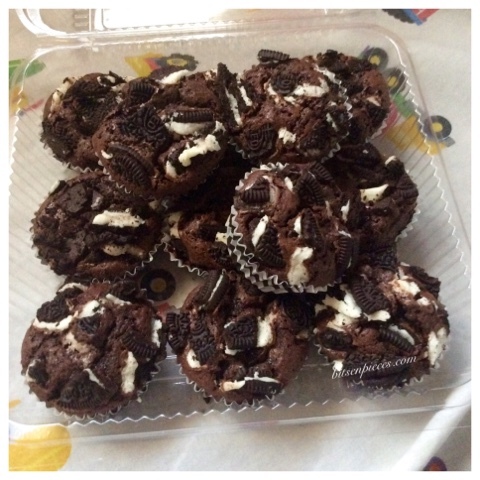 And, when he came back he surprised me with this dozen of Oreo cupcakes as his Valentine present for me ( what a way to wake up from a afternoon nap with all smiles on my face ). He ordered from a friend from his football team who bakes. 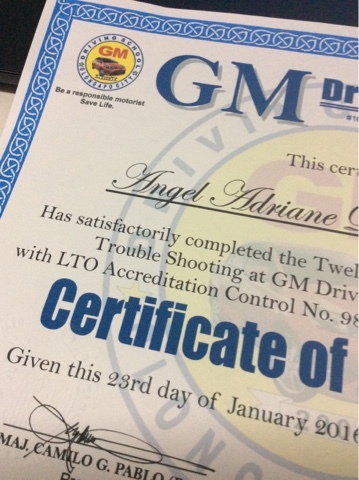 I love this kind of surprises from him.... goodjob Anak, I imagine the "lucky girl" in the future... not next year ha, ayaw ko pa haha! 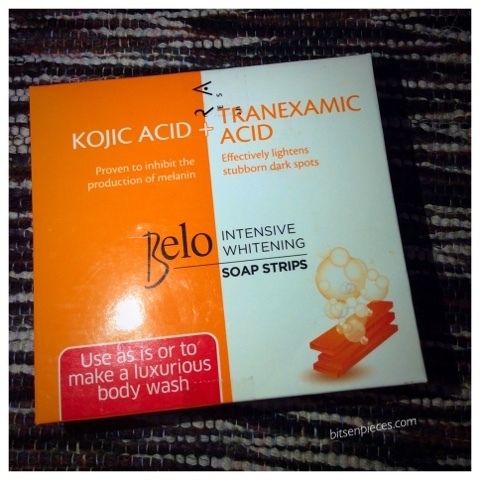 I made coffee paired with this and some pandesal and butter for our merienda. And so last night as a pre-Valentine treat, we went to Sam's Pizza for some nacho chips, chicken in a basket, my frozen margarita, coffee and chocolate shake for the daughter plus a couple of band who plays regular there. Kuya did not come with us as he went to meet his friends for dinner. At the strike of 12 midnight my daughter M handed me this Valentine card she prepared when I was at work. The thoughtful M, as always! It's Sunday morning and I am glad that this morning it started relax and quiet. I woke up a little late than my usual, had coffee and some pandesal for breakfast. 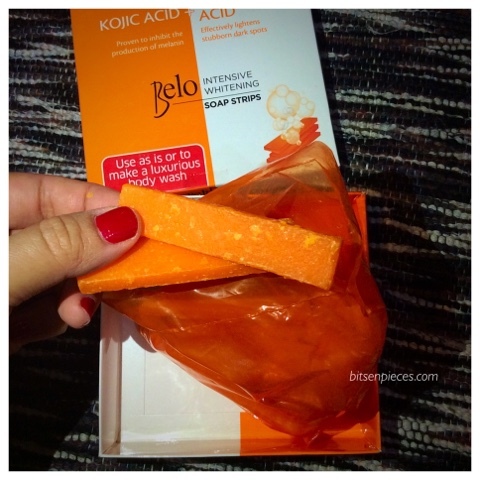 Load up some laundry to finish while I do this blog post. Today, is such a lovely day to celebrate Valentines day with your loved ones. It doesn't have to be that fancy and extravagant so you don't have to force yourself to give someone what you cannot afford to give. Spend time and enjoy that time together is the key to everything. 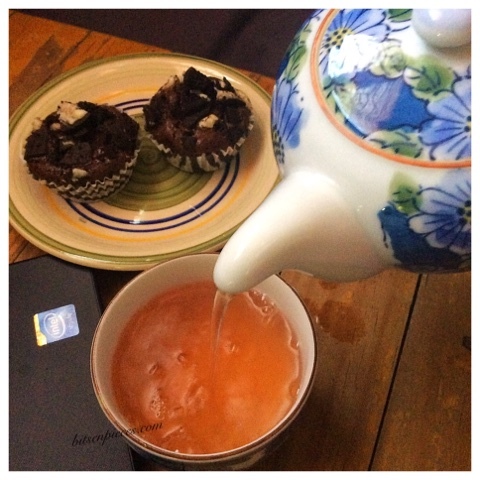 I prepared some tea and cupcakes from last night. 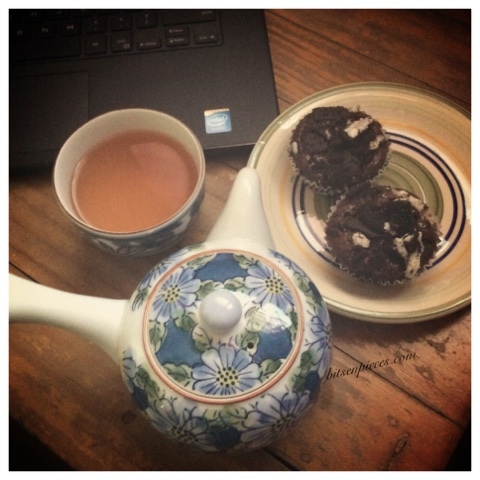 Teavana Flavored White Berry Basil Blast + Oreo Chocolate cupcakes for mid-morning snack while I blog. 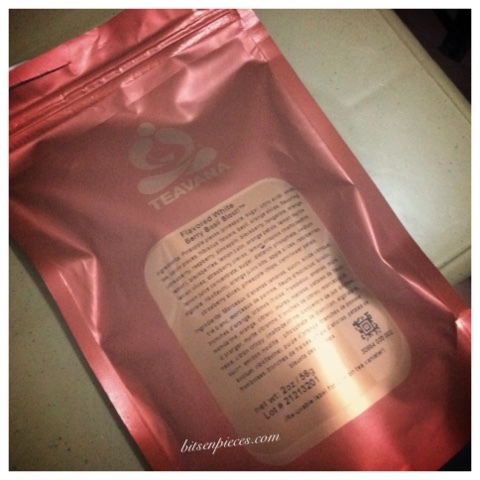 My Ma gave me this pouch of loose Teavana Berry Basil tea last week. Later tonight, we will hear the afternoon Mass and will end our day with a dinner reservation we made for the family. How did you spend your Valentines? I hope you're having a good one too... just like what I am having. 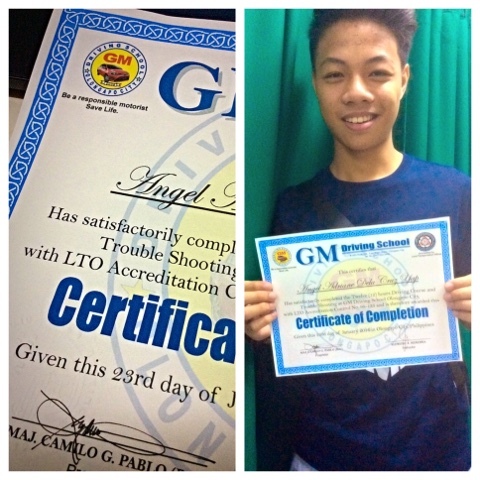 A few minutes ago, I received a call from the store manager of Greenwich Pizza-SM Olongapo where I received the prize. Just last night they received the report which I placed on Greenwich Pizza Facebook page. Mr. Jovs apologized for what happened and assured that they will investigate on what happened and assure that the standards will be met when it comes to their food items. He also thanked me for the feedback... making them aware of the incident. He also offered a half pan of the macaroni and a pizza to compensate on what happened. I requested for it to be delivered at my parents house...for it was really meant for them.